At ‪#‎NYCC2013‬ buy any Kamen Rider S.H. 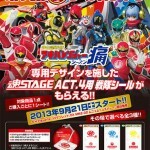 Figuart and get a FREE random Rider themed Tamashii ACt stage! Also, buy any Power Ranger S.H. 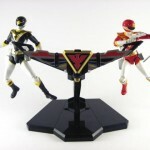 Figuart and get the Power Ranger ACG special S.H. Figuarts card that was at SDCC 2013 FREE! Have fun at NYCC and stay tuned for our coverage which starts very soon! Similar to the Riders on Stage promo awhile back, Bandai is launching a new promotion involving Tamashi Act Stage stands. This time, the give away will be themed around Akibaranger Season 2. Unlike the last promo however, they will be giving out decal sheets to be applied to Tamashi Act Stage 4 stands. Any Super Sentai related S.H.Figuarts that was released at mass retail will be eligible for this give away in addition to the Munya Munya Zuban and Moya Moya Z Cune roleplay toys. The three Akibarangers will be getting their own decals along with TyranoRanger, Hurricane Red, and Ryuranger. Z Cune Aoi will also have her own personal stand and there’ll even be one that has the S.H.Figuarts logo and slogan on it. The promo event will begin September 21st. Tamashii Stage Act Trident – Mass Release! Originally only included with Bandais Super Robot Chogokin Might Gaine the Tamashii Stage Act Trident will be seeing a complete mass release! Though this stage originally came with a figure unrelated to tokusatsu many collectors have taken to displaying their S.H. Figuarts, S.I.C.’s, and SRC Sentai robos on these stages. Bandai responded to a huge fan demand that these stages be made publicly available to tokusatsu collectors. 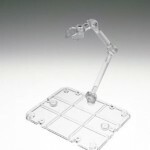 Now they will have the opportunity to own these handy display bases in 3 colors; Clear, Transparent Black, and White! The stages will be available from May, costing 1260 yen each.